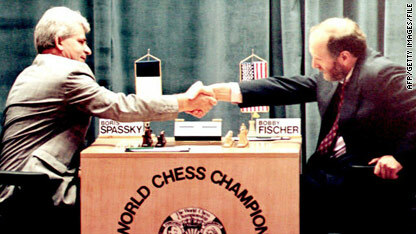 American chess guru Bobby Fischer shakes hands with chess master Boris Spassky before their match in 1992. Iceland's supreme court Thursday ruled in favor of a request by Jinky Young, the alleged daughter of Bobby Fischer, to exhume the chess master's remains, Young's lawyer told CNN. This story is developing. We'll bring you the latest information as we get it. Marilyn should be put up in JAIL If they found out that she lied! Because exhumation of Bobby's graveyard is a Big NO!NO! Sounds familiar! I just heard it also with somebody!